Being a food blogger has its perks! We get opportunities to try all sorts of products and then we get to share them with you! I tend to be picky about what items I’m willing to promote on this blog because they not only have to be tasty, they have to be healthy AND they have to be practical and useful. I don’t use many processed or packaged foods because I prefer to use fresh ingredients whenever possible. Sometimes, though, it’s not always practical to make the item yourself. Sometimes it makes more sense to grab the pre-made item. And, when I find items like this I get really excited because that makes the process quicker and easier! 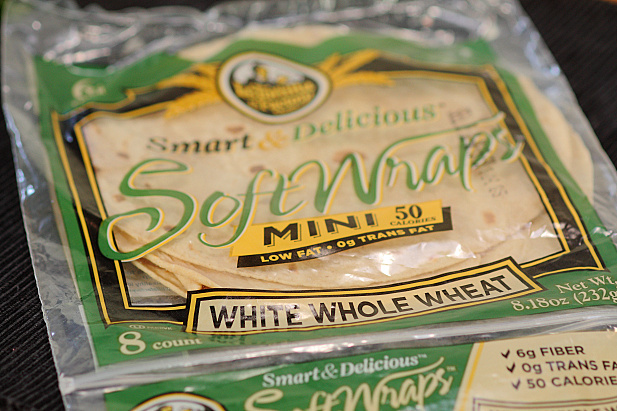 I received a package of La Tortilla Factory White Whole Wheat Mini Soft Wraps when I was at Camp Blogaway and I just loved them! Not only are they soft and crisp up nicely, they are only 1 Points+ each! 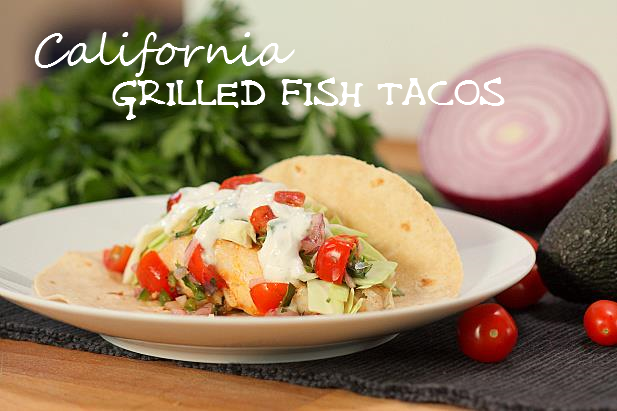 I immediately thought of the SoCal standard, the amazing grilled fish taco. Now I LOVE to make fish tacos. It’s one of my favorite meals of all time. Nothing says summertime, beach and California quite like it. 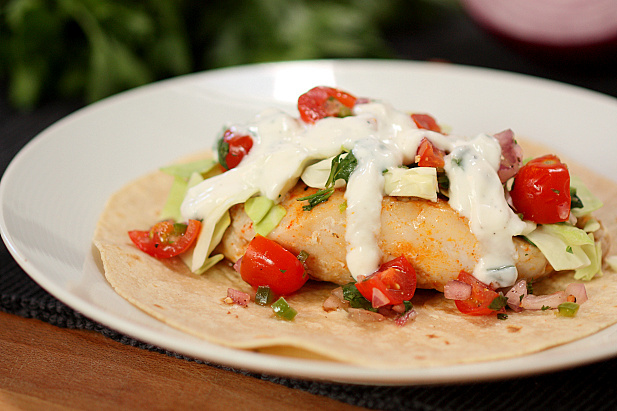 You can go all over Southern California searching for the best fish taco or you can just make your own! 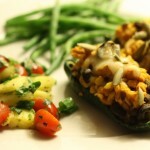 This recipe is incredibly simple and it’s a fun meal to share with a group. 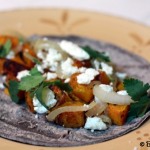 Everyone gets to assemble their own taco with their own favorite ingredients. Kids love it! *I received a complimentary free package of La Tortilla Factory White Whole Wheat Mini Soft Wraps from the company. My opinions are my own and I have not been paid to provide positive comments. Quarter the tomatoes. Finely mince the jalapeno pepper. Combine in a small bowl with the red onion, cilantro, lime juice, salt & pepper. Toss together. Combine all ingredients in a small bowl and stir well to mix. Chill for at least 30 minutes. Heat a grill top or cast iron skillet on high heat. Lightly sprinkle the fish filets on both sides with the smoked paprika, salt & pepper. Be careful not to over-salt the fish. Less is better. Spray the grill top or skillet with cooking spray/oil and place the fish filets on the grill. Let cook 2-3 minutes or until the fish starts to become opaque on the sides. Do not move the filets around or flip before then. Flip the filets over and continue cooking another 2-3 minutes. Remove from the heat. 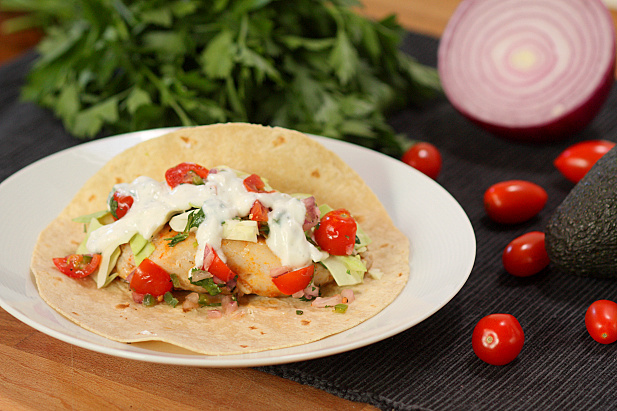 Serve with warmed tortillas, cabbage, pico de gallo and green onion crema. 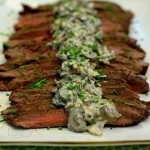 Also great served with avocado or homemade guacamole! Brandon, you got it. The crema is what makes it! You’d almost get me eating fish with this recipe! However, that green onion crema sounds divine. I bet it would be equally delicious on some grilled chicken. Kimmie, it is good on chicken and steak. We’ve had it on both. These look healthy and fantastic!